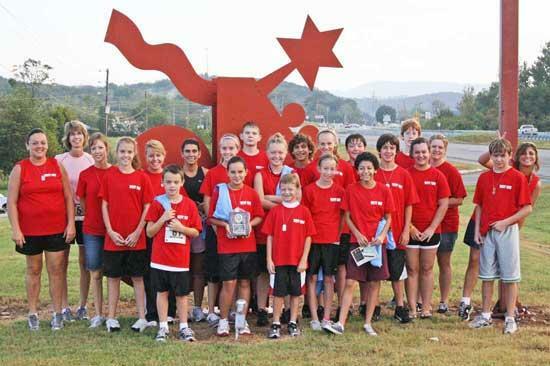 The West Side Ponage Race Team received a trophy for the largest group participating in the Cannon Blast 5K run, with a total of 34! Pictured: Kerrie Miles, Diane Hickman, Lynn Gragg, Katie Hickman, Shelly Adams, Brandon Miles, Josie Sissom, Sarah Hickman, Akristia Sissom, Jacob Nave, MacKenzie Adams, Gus Davenport, Sam Sissom, Kendra Maynard, Ashleigh Anderson, Turner Gragg, Elva Magana, Jake Burdick, Walker Hatfield, Eleanna Sissom, Missy Hatfield, Collin Anderson and Melissa Anderson. Not Pictured: Principal Robert Sain, Roger Haley, Robbie Maynard, Jamie Nave, Jackie Burdick, Guylene Ozlanski, Shannon Davenport, Bode Davenport, Reece Wisdom, Kelsie Smith.